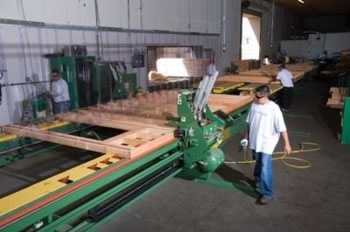 Our panelized building systems retain the best aspects of stick frame construction but far exceed quality standards due to precision construction inside the plant, out of inclement weather. Panels are constructed on wall jigs, allowing for square and evenly spaced studs. They are inspected and numbered to correspond to a detailed set of plans. Then, trained operators run a stapling bridge that attaches sheathing to the wall panels six inches on center. Each staple is center-fired on the studs with a precision and power that could never be achieved in the field, enhancing the strength and durability of the finished panels. We deliver a well-designed, energy efficient and beautiful new home or Church structure. than a similar stick-built structure. Our Energy Star compliancy results in a 30% less energy use. Your structure is framed quicker, with roofing, siding, doors and windows, keeping your home secure and out of the rain, snow and wind.